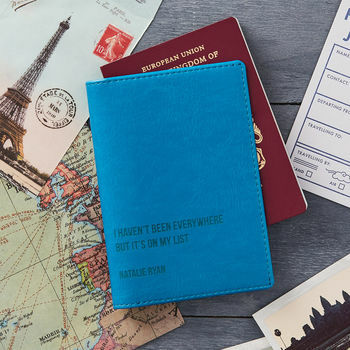 A personalised passport holder and cover makes the perfect gift for travellers everywhere. Customise with your favourite travel quote and a message of your own. 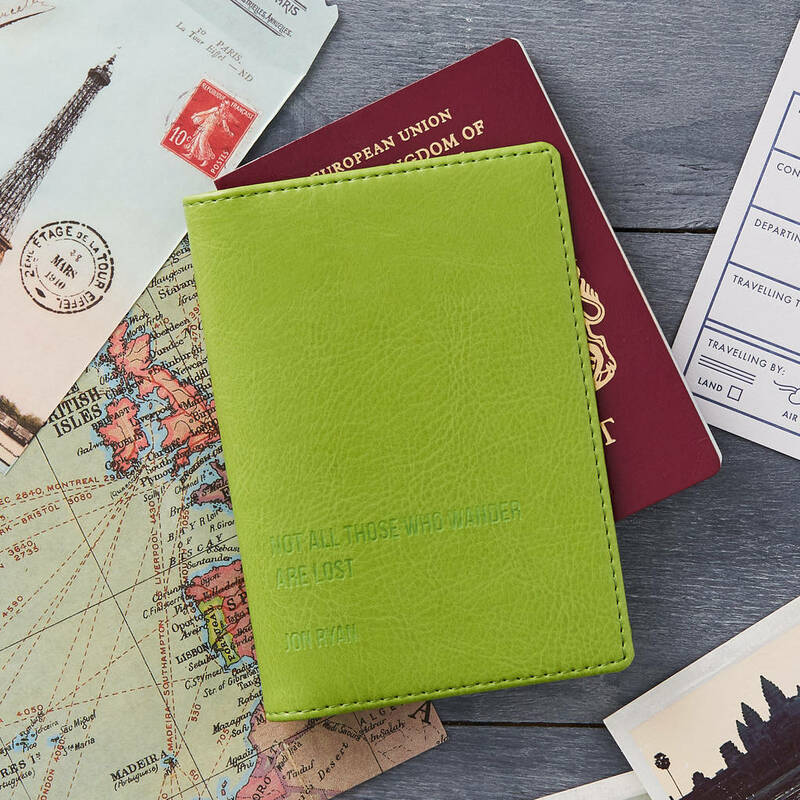 Capture your favourite world destinations on our bespoke passport holder. List the places you have visited, or the ones you dream of seeing one day. Or put them all in a creative rhyme or song lyrics! You are only limited by your imagination. Travel is the only thing you can buy that makes you richer! And if you know someone who loves to travel then this could be the perfect gift. 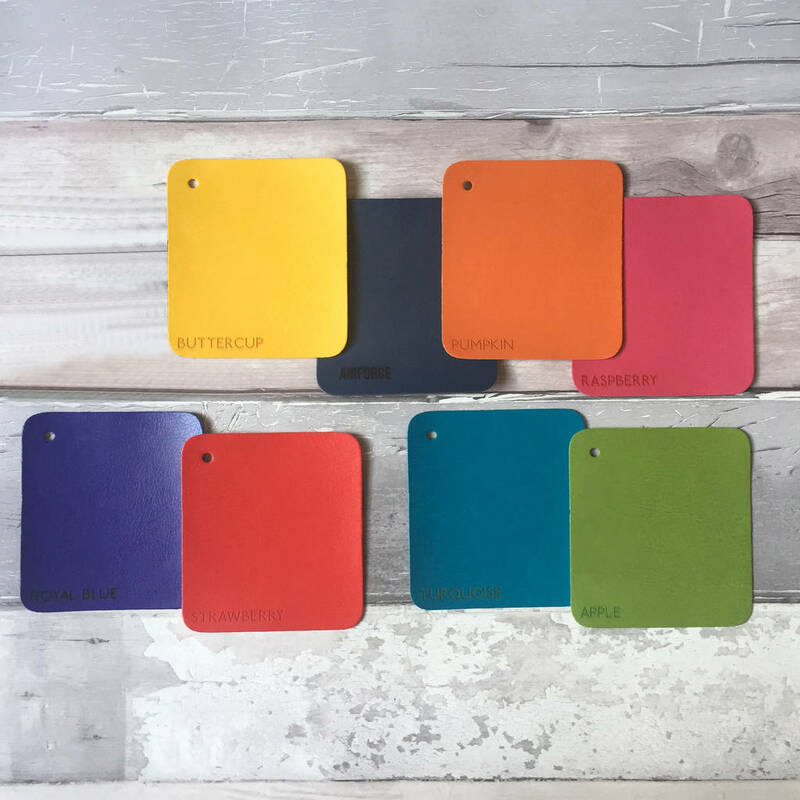 Our soft PU leather-feel passport holders come in a beautiful range of bright and fun colours. 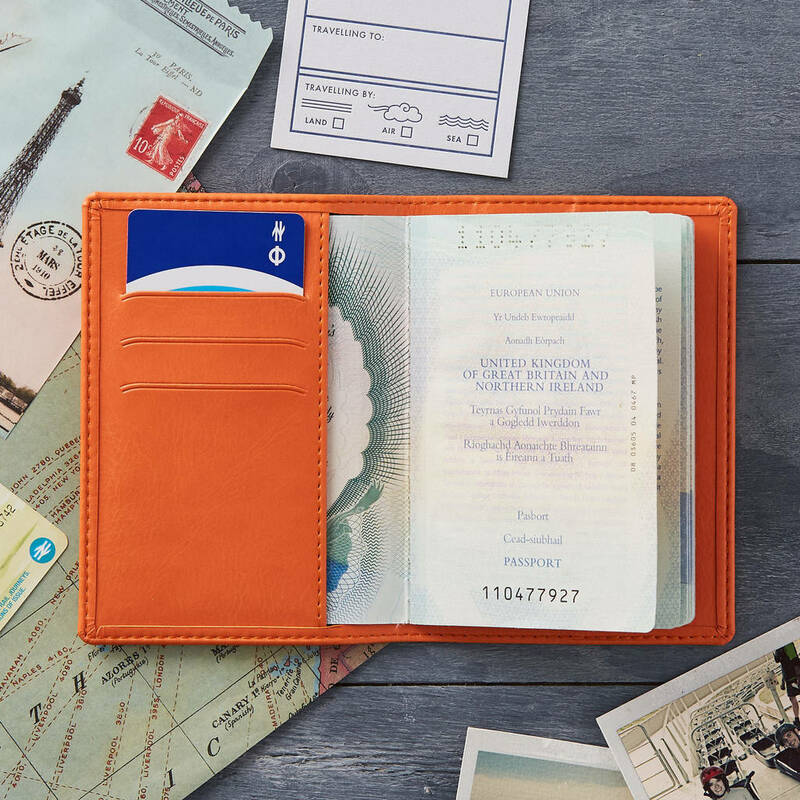 Slip the passport inside, where there's an additional three credit card slots as well. "Travelling. It leaves you speechless then turns you into a storyteller." "Twenty years from now you will be more disappointed by the things you didn't do than the things you did. So throw off the bow0lines. Sail away from the safe harbour. Catch the trade winds in your sails.Explore. Dream. Discover." Then simply add a personalised message of your own to be engraved underneath the quote. It could be as simple as a name, or a message like "safe travels, love Mum x"
Please double check your personalised text when you place your order as we will engrave exactly what you have typed. All text will be in uppercase/capitals. 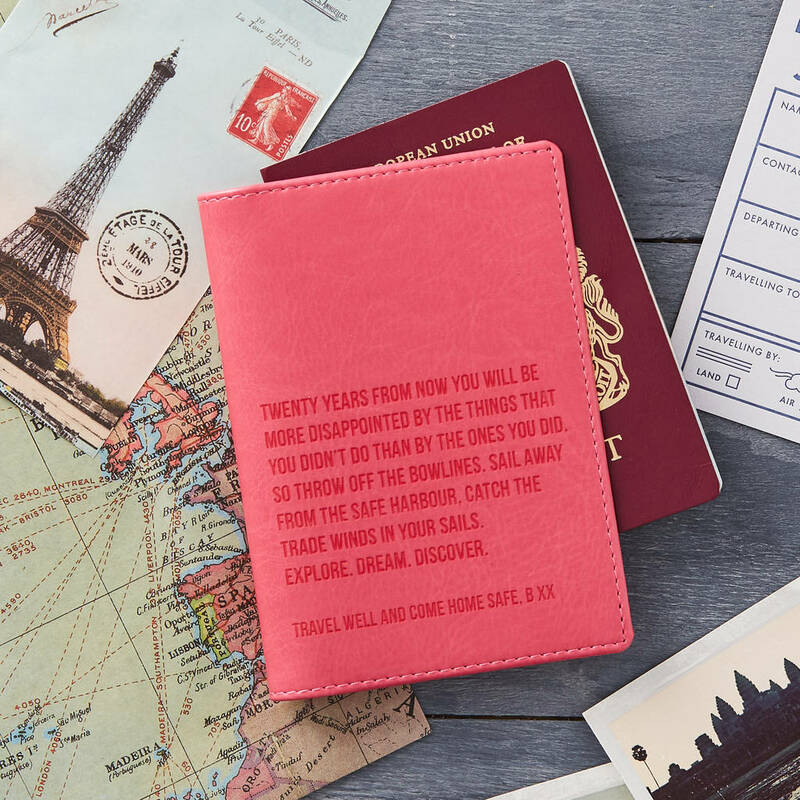 These personalised passport holders are made from a very good imitation PU leather or vegan leather. No animal products were used in the creation of this product. So, ethically it wins! Although from looking at it, you could easily believe it was genuine leather. It feels soft and smooth and has a slight leather textured finish. The inside of the passport holder is lined with a black nylon protective fabric. This product is dispatched to you by Luna Studio Designs.